Hydraulic Fracturing: What Can’t It Do for Our Energy Security? Hydraulic fracturing and horizontal drilling are the twin tanks of the shale revolution and it’s not just about gas; it’s about crude oil and security, too. Yesterday’s Today In Energy post at the Energy Information Administration (EIA) site tells so much about the beauty and extent of the shale revolution. The combination of hydraulic fracturing with horizontal drilling hasn’t just made the U.S. the leader in natural gas production that it now is, but has also made our nation far more energy secure in terms of crude oil as well. Hydraulic fracturing in tandem with horizontal drilling is a the kind of invention that historians will write about in the same way they once wrote about Eli Whitney’s cotton gin and Robert Fulton’s steamboat. We might well ask, in fact, what it can’t do for our energy security. 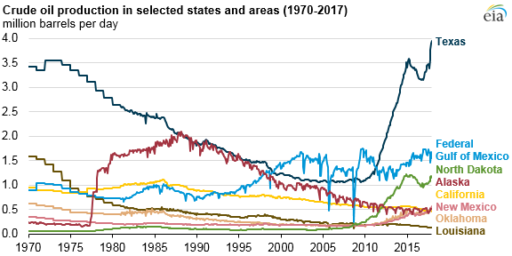 Take a hard look at New Mexico, North Dakota and Texas, the first two being wholly new centers of crude oil production and Texas experiencing an incredible revival. The stunning growth in New Mexico is a real eye-opener, but so is what’s happening in Oklahoma, Colorado, North Dakota and, of course, Texas. Hydraulic fracturing has made something no one dreamed was even possible a decade ago a new reality; an America that is not just energy secure, but also energy dominate. “Production levels in Colorado, Oklahoma, and North Dakota,” in fact, “each grew by more than 30,000 b/d from 2016 to 2017,” according to EIA. It doesn’t get any better. The shale revolution is real, it’s overwhelming and it’s making us all a lot more energy secure in a world where everyone else would love to take advantage of us. The post Hydraulic Fracturing: What Can’t It Do for Our Energy Security? appeared first on Natural Gas Now.